Amir Khan’s trainer Virgil Hunter is really beating the drum in hopes that Floyd Mayweather Jr. won’t slip away and leave Khan with a much lesser fight. In trying to sell Khan as the perfect opponent for Mayweather’s next fight on May 3rd, Hunter is being vocal about his belief that the struggling Khan can pull off an upset and beat Mayweather in this fight. As for why Khan keeps getting knocked out, Hunter blames on Khan being at the wrong weight. Hunter feels that now that Khan has moved up to welterweight the knockout defeats he’s been suffering will disappear. I’m not sure that I agree with him, but if that’s what he believes then I guess we’re going to find if he’s right sooner or later when Khan starts fighting again. Khan hasn’t fought since last April when he beat past his prime former lightweight champion Julio Diaz by a controversial 12 round decision in London. I can see why Hunter would want Khan to get the fight with Mayweather, because that would victory all to itself. It doesn’t matter if Khan gets knocked out like he did against Breidis Prescott and Danny Garcia. Just getting the payday bout would give Khan enough money to retire on, and not have to worry about mixing it up with lions like Keith Thurman, Kell Brook, Shawn Porter or even Adrien Broner. This would be like a cash out fight for Khan if he could get the Mayweather fight. 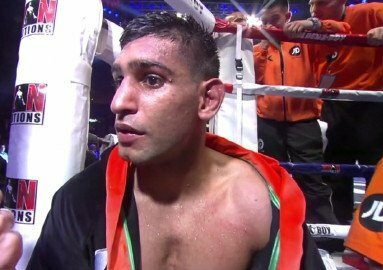 With 2 defeats in his last 4 fights, this fight would be coming at the right time for Khan, because things are starting to look a little bleak for him. The writing is on the wall for Khan that he likely won’t be able to stick around and be a factor at 147 or even 140. That’s why it would be a gift if Khan could get the Mayweather fight now before he gets beaten again. He almost lost his last fight against Julio Diaz, and that would have given Khan 3 defeats in his last 4 fights. That was against a fighter that he should have been able to beat easy or at least in a convincing manner.